Oh, the misplaced agony and outrage over smaller IRS refund checks! For a while this morning the lede news story on Yahoo!’s opening page was a HuffPost piece about people being angry that they are getting smaller refunds due to the Trump tax cuts. The story does at one point in passing note that the tax code changes meant that in some cases not enough money was withheld by employers. But nowhere in it does it note that in the vast majority of these cases the total tax bill for 2018 is less than the prior year. People just got to kept it with each paycheck and did not make interest-free loans to the federal government. As Bugs Bunny would say: What a bunch of maroons. Chalk this up as fake news. Of course, now that Democrats — who have made a career out of demanding soak-the-rich taxes in order to redistribute it to the poor — are in control of the U.S. House of Representatives one their first priorities will be to provide a tax break for the rich — in certain Democrat-controlled states. According to Forbes, today’s Review-Journal editorial and others, a top priority will be a repeal of the $10,000 cap on IRS deductions for state and local taxes (SALT). According to the Tax Policy Center, three-quarters of the benefit of the SALT deduction goes to households making $153,000 or more. The Tax Foundation says 88 percent of the benefits flow to those making more than $100,000 a year. So it benefits the rich, but just the rich in certain states. Nevadans — along with residents of New Hampshire, Florida, Wyoming, Texas, South Dakota and Alaska — get to deduct about 1 percent or less of their adjusted gross income, while those who live in New York, Maryland, D.C. and California deduct more than 5 percent. Nearly one-third of the dollars generated by the SALT cap is borne by Californians and New Yorkers, both heavily Democratic states. Using 2010 statistical data from the IRS, you find Californians who filed for state and local income tax deductions claimed deductions of $10,700 per return. Nevadans who filed for the state and local sales tax deduction claimed only $1,430 per return. Calculated on a per capita basis, Californians claimed $2,116 in federal income tax deductions, while Nevadans claimed only $166 per person for sales tax deductions. It’s called voting with your feet. A remarkable number of well-heeled Americans are doing just that, and it should serve as a warning to Nevada voters and candidates as we enter an election year. Though Republican governors in recent years have shepherded through the Legislature record-high tax increases, Nevada still fares fairly well in comparison to other states when it comes to the tax burden borne by citizens of the Silver State. According to the Tax Foundation’s analysis of state and local tax burdens per capita for fiscal year 2012 — which is after Gov. 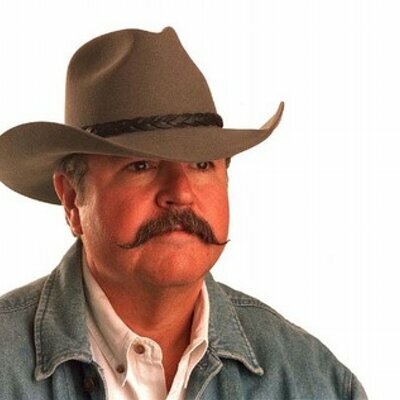 Kenny Guinn’s billion-dollar tax hike but before the $1.5 billion tax hike pushed by Gov. Brian Sandoval — Nevada ranked 43rd lowest in the nation, while neighboring Taxafornia ranked sixth highest. Nevada tax collectors grabbed 8.1 percent of the state income through state and local taxes or $3,349 per capita. Meanwhile, California snatched 11 percent of state income or $5,237 per capita. Perhaps that explains why, according to Internal Revenue Service data on taxpayer migration, from 2014 to 2015 about 10,500 Nevada taxpayers moved to California, while 17,700 California taxpayers moved to Nevada. Even more telling is the fact that the Californians fleeing to lower-taxed Nevada averaged $91,000 in gross adjusted income, while the Nevadans heading to California averaged only $47,400 in adjusted gross income. It seems people with higher income have a tendency to find ways to keep more of it for themselves. From 2014 to 2015 Nevada netted an increase in total adjusted gross income reported to the IRS of $1.43 billion. Of that, $1.1 billion came due to the influx of Californians changing residencies. An analysis of a sampling of that IRS data shows the California-Nevada migration pattern is no anomaly. In that one year, the state of New York, which has the highest state and local tax burden of any state at 12.7 percent of income and $6,993 per capita, lost $4.4 billion in income. No. 2 highest Connecticut lost $1.3 billion in income. No. 3 highest New Jersey lost $2.46 billion. No. 5 Illinois lost $3.47 billion. No. 6 California lost $2.09 billion. Meanwhile, state income tax-free Texas, ranked 46th lowest, added $3.61 billion, and state income tax-free Florida, though only 34th lowest, added $11.65 billion. The latter might have something to do with weather as well, since $2.62 billion of that came in from former New Yorkers, $1.49 billion from former New Jersey residents and $1.47 billion from former Illinoisans. The New Jersey residents who moved to Florida had an average income of $121,000, while Floridians moving to New Jersey averaged $72,500. This is hardly surprising nor a new phenomenon. In an article in The Wall Street Journal in 2009 under the headline, “Soak the Rich, Lose the Rich,” economist Arthur Laffer and WSJ economics writer Stephen Moore updated previous studies and found that from 1998 to 2007, more than 1,100 people every day of the year relocated from the nine highest income-tax states — such as California, New Jersey, New York and Ohio — mostly to the nine tax-haven states with no income tax — including Florida, Nevada, New Hampshire and Texas. Laffer and Moore determined that over that period of time the no-income tax states created 89 percent more jobs and had 32 percent faster personal income growth than the high-tax states. A recent WSJ editorial noted that billions in income are still flowing out of New York, New Jersey and Connecticut and into Florida. 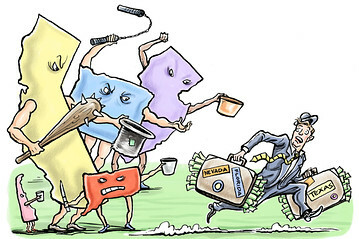 “As these state laboratories of Democratic governance show, dunning the rich ultimately hurts people of all incomes by repressing the growth needed to create jobs, boost wages and raise government revenues that fund public services,” the editorial concluded. Voting with the feet is sure to increase since the recent tax reform limits federal income tax deductions for state and local taxes. Let this be a lesson for Nevada. Chase the rich, they’ll run away. It looks like a tax reform proposal that could have resulted in lower income tax rates for Nevadans is swirling down the drain. The Los Angeles Times is reporting that congressional Republicans are considering jettisoning a part of President Trump’s proposal that would eliminate IRS deductions for state and local taxes. Dropping the deduction would generate $1.3 trillion in additional federal revenue, thus allowing lower rates for the 70 percent of Americans who do not itemize and take the standard deduction. While Democrats insist tax reform should in no way benefit the wealthy, the retention of the state and local tax deduction does precisely that for the wealthy who live in Democrat-controlled high tax states, such as New York and California. The Times conceded that Californians benefit more from the state and local tax deduction than taxpayers in any other state. In fact Californians managed to dodge $101 billion in taxes in 2014 — New York, New Jersey and Illinois were next on the list of top tax dodgers. Of the top 10 states for the deduction, Trump carried only three. The New York Times also is reporting that some Republican spines are weakening, noting that elimination of the deduction has Republicans in high-tax states worried about backlash from voters whose tax bills might rise. Using 2010 statistical data from the IRS, Californians who filed for state and local income tax deductions claimed deductions of $10,700 per return. Nevadans who filed for the state and local sales tax deduction claimed only $1,430 per return. Calculated on a per capita basis, Californians claimed $2,116 in federal income tax deductions, while Nevadans claimed only $166 per person for sales tax deductions. Reagan failed, primarily because there were too many Republican lawmakers from New York and California, just as there are today. California has 14 Republicans in the House and New York has nine. If Congress caves in to the few who want to keep their lucrative state and local tax deductions, it is unlikely the 70 percent of Americans who currently do not itemize can be afforded a doubling of the standard deduction as is currently being contemplated. The tax code should be fair and equitable for all and not carve out breaks for some. So President Trump has finally decided to take our advice. More than a year ago this newspaper noted in an editorial that then presidential candidates Ted Cruz, Marco Rubio, Chris Christie, Jeb Bush, John Kasich and Ben Carson all had proposed repealing the IRS deduction for state and local taxes, but Trump was still vague on the matter. Nevada is one of only nine states with no state income tax to deduct. Since the creation of the federal income tax in 1913 the residents of states with income taxes have been allowed to deduct those taxes from their federal obligation. Only in recent years have Nevadans been permitted to deduct sales taxes, but this is subject to the whims of Congress because it must be renewed every year. This past week Trump’s one page tax reform plan called for eliminating all deductions except for home mortgage interest and charitable contributions. 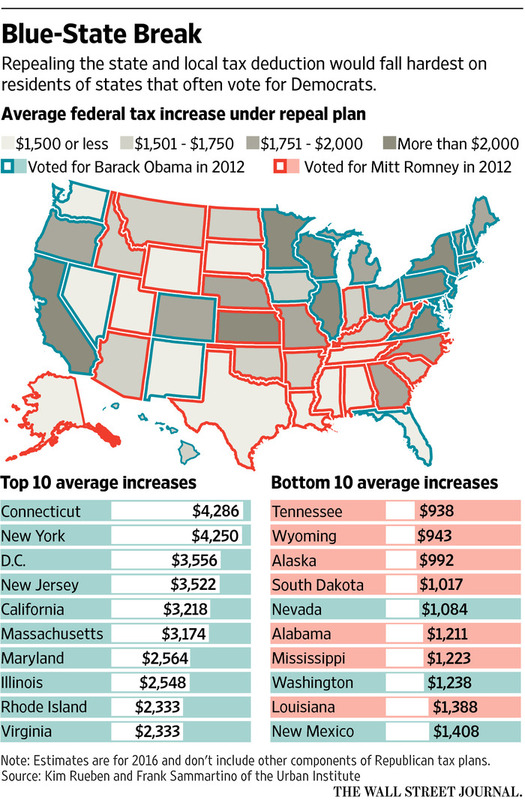 Predictably, the high-tax states are whining. Nevadans — along with residents of New Hampshire, Florida, Wyoming, Texas, South Dakota and Alaska — get to deduct about 1 percent or less of our adjusted gross income, while those who live in New York, Maryland, D.C. and California deduct more than 5 percent. The federal government is effectively subsidizing the big spending in those states at the expense of the lower tax states. As we pointed out a year ago, using 2010 statistical data from the IRS, the most recent available, you find Californians who filed for state and local income tax deductions claimed deductions of $10,700 per return. Nevadans who filed for the state and local sales tax deduction claimed only $1,430 in deductions per return. Heritage Foundation researchers Rachel Greszler and Kevin D. Dayaratna have concluded that the state income tax deductions subject federal tax revenues to the whims of state lawmakers and largely benefit wealthy taxpayers and those in high-tax states. It is long past time to upset this century-old unfair tax break for some and tax burden for others. Where do we go to get a rebate for being overtaxed all those years? After The New York Times splashed the news that someone had anonymously mailed one of its reporters Donald Trump’s 1995 IRS returns — reporting of which is a violation of federal law, according to American Thinker — Harry Reid posted to his official Senate website a scathing putdown of the Republican presidential nominee. The Times account says Trump declared a $916 million loss on his 1995 income tax return and speculated that a loss of that amount could legally allow him to avoid paying any income taxes for up to 18 years. “Trump is a billion-dollar loser who won’t release his taxes because they’ll expose him as a spoiled, rich brat who lost the millions he inherited from his father. Despite losing a billion dollars, Trump wants to reward himself with more tax breaks on inherited wealth while stiffing middle-class families who earn their paychecks with hard work. This is from a member of the Club of 100 which votes on treaties and advises and consents on major presidential appointees but who has consistently refused to release his own tax returns. This the same Reid who during his 1974 Senate race against Paul Laxalt questioned Laxalt’s ties to Howard Hughes. Reid challenged Laxalt to reveal his and his family’s finances, according to a Las Vegas newspaper account years later. Reid held a news conference to hand out his own financial statements and tax returns for himself and his three brothers, challenging Laxalt to do the same. “Any man or woman who will not be completely candid about his or her finances does not deserve to be in public office,” Reid was quoted as saying by The Associated Press. 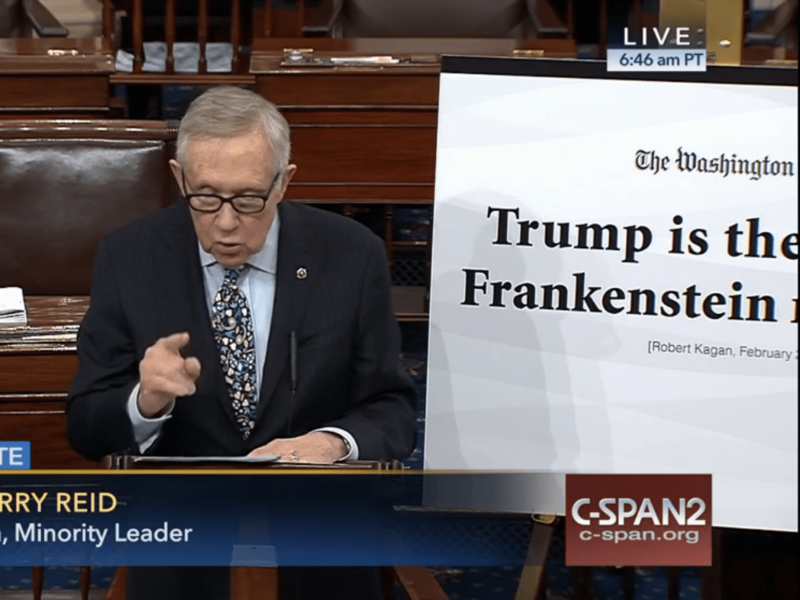 Reid on Senate floor calls Trump a Frankenstein. Donald Trump spent 40 minutes this morning lambasting the press for daring to criticize his dalliance is delaying providing donations to veterans groups raised during a January fund raiser, as well as giving a rundown of the money his is doling out, including a million bucks of his own money. He called one reporter from ABC a sleaze. He also noted that a check has been cut for one of the organizations, Project for Patriots, but the check will not be mailed until the vetting is complete. “The check is ready to go, but they don’t have all of their appropriate” documentation, he said. That documentation? An IRS determination letter. Trump will not give money raised by others to any group until it has proven its worthiness with verification from the IRS. Trump also won’t release past IRS returns, claiming they all are somehow interrelated. So, if Trump will not allow himself to be vetted, why should anyone think it is appropriate to write him a check or vote for him? Isn’t his stance a bit hypocritical? Oh yeah, this is Trump, the human Etch-a-Sketch.